The online store will be taking orders until 11:59pm on Sunday, April 21st. Entry Fee: $10.00 per Wrestler (Non Refundable). CASH ONLY!!! Please use the Southwest entrance to enter the school located adjacent to the tennis courts. Weigh-Ins will occur at registration and weights written on the arm of the wrestlers. Wrestlers can wear singlets to compete in and headgear is not required. Split kids up based on their wrestling experience (Experienced or Beginner) and weights and try and get them as many matches as possible within the hour and a half time frame. Wrestlers will be paired up and will wrestle matches against one another. There will be no referees and no official score keeping. Wrestlers can keep track of their scores and/or parents can keep track of the score sitting in the stands watching the matches take place. The goal of Match day is to get in 4-6 live matches against other wrestlers from different clubs and do so in an environment where everyone is wrestling at the same time so that the whole day is not consumed. Get in, get matches and get out is the theme. This format has become widely successful in California and other states. Wrestler will be ranked as either Experienced or BEGINNER. Team can send entries to: jasonkeck@yahoo.com. Otherwise, wrestlers will register onsite at Noon on Sunday in the main gym. Water and/or Gatorade will be for sale for athletes to stay hydrated. All Wrestlers must present their USA Wrestling Card at registration. Greater Heights, Oak Park, and the North Kansas City School District will not be responsible for accidents, injuries, and or lost/stolen items. FIRST MATCH DAY A SUCCESS! Wrestlers got in 5-7 matches in an hour and a half for only $10. Bleachers were available for parents to sit and watch their wrestlers compete. The wrestlers enjoyed meeting new friends today and having fun being able to just wrestle and not worry about winning and losing. All youth wrestlers are invited to come be a part of the next Match Day on December 9th at Oak Park HS. Register onsite, no preregistration required -only $10 per wrestler. We will host two preseason clinics on Tuesday, October 30th at Park Hill High School from 6-7pm in the wrestling room and on Sunday, November 4th at Oak Park High School in the wrestling room from 4-5pm. These clinics will give kids an opportunity to come experience what wrestling is all about and how a typical practice will be during the season. The cost of the clinic is $10 and you will register onsite. Shorts or sweatpants and a shirt is all that is needed to participate. There are also a couple of "Back to the Mat" B2M sessions still available where children can come check out a practice and the program before the season starts. Those dates are Oct. 10th at Park Hill HS from 6:15-7:45pm for ages 7-14 and Oct. 17th at Oak Park HS from 6:15-7:30pm for ages 4-6. The last B2M is Oct. 18th also at Oak Park HS from 6:15-7:45pm for ages 7-14. The cost of these practices are $10 for current club members and $15 for non-club members. Please contact Coach Morales at airwarrior1225@gmail.com if you have interest. The start of the season will begin on Thursday, November 1st at Park Hill for the Greater Heights Level 2 (advanced) wrestlers. For the Level 1 (novice and intermediate) wrestlers the first practice will be on Monday, November 5th at Oak Park and the first Light Infantry (4-6 year olds) practice will be on Tuesday, November 6th at Oak Park. For those playing football this fall, if you are still in your season when we begin or if your athlete needs a short break afterwards then he/she will be able to jump into the regularly scheduled practices at anytime during the month of November. This year we will also have a Kansas USA wrestling charter and the program will practice on Tuesday nights at Lansing High School in Leavenworth County. For more information about costs, practice schedules, etc., please contact Coach Keck at jasonkeck@yahoo.com or 816-863-7002. USA Competitor Cards expired on August 31st, 2018. As such each athlete who is or will be training and competing this upcoming season will need to renew or obtain a new 2018-19 competitor card. This can be done either through our club or online at http://www.themat.com. The cost of the card is $41. The card provides supplemental injury insurance while practicing or competing and also is a requirement to compete in any USA Wrestling sanctioned event. If you wish to purchase the card through the club please provide payment to Coach Keck at one of the scheduled workouts. Here is a list of preseason competitions and events that the program will have coaches and athletes attending. You are responsible for signing up your athlete and paying their entry fee. The various links are provided below. For Preseason Nationals, I have provided a link for hotels. I have booked rooms at the Holiday Inn Express and Suites located on 11th Street in Downtown Des Moines. You can choose to book rooms at that hotel or one of the other hotels in the area. The location has a complimentary breakfast and free parking. You can make reservations by calling the 800 number and securing the room with a credit card. You can cancel up until the day before your stay so even if you are on the fence then you can reserve now and cancel later if need be. Make sure you ask for the "USA Preseason Nationals" rate. The MissouriWrestling.com /Greater Heights Wrestling Combine is scheduled forOctober 6th and 7th at Oak Park HS. This is for 7th graders-12th graders. College coaches will be coming to share information about their colleges/universities and to recruit potential athletes for their programs. For the middle school and high school wrestlers this is a great chance to hear what coaches are looking for in a student-athlete and what breeds success at the next level. We will have college coaches and senior level wrestlers as clinicians for this event. The Oklahoma RTC is going to bring a number of quality wrestlers up from OK to participate in this year's event. Greater Heights Wrestling 4th training semester starts on Tuesday, Aug. 21st and will run through October 18th. Practices will be on Tuesdays & Thursdays at Park Hill from 6:00-7:45pm & Sundays at Oak Park from 2:00-4:00pm. Register onsite or email Coach Keck at jasonkeck@yahoo.com and he will email you the registration form and waiver in advance. If your wrestler has been a part of the prior training semesters this year (2018) no additional registration paperwork is needed - just payment. Both youth & HS wrestlers are invited to participate no matter of their club or school affiliation. The cost for the 9 weeks of training is $150 per athlete with a sibling discount of $30 off the second fee and $50 off the third fee. There is a one day a week option designed for those traveling long distances to train and/or for those athletes that are playing a fall sport. One day option cost is $75 per athlete with no sibling discount. Lastly, we will allow a drop in fee option of $15 per practice, per athlete. New youth wrestlers and Novice youth wrestlers in their 1st or 2nd year can also participate in our B2M "Back to the Mat" sessions that will occur on Aug. 22 for Light Infantry (4-6 yrs old) at Oak Park HS from 6:00-7:30pm and Aug. 23 for Novice (7-14 yrs old) from 6:00-7:45pm at Oak Park HS. Mark your calendars for the future B2M dates which are as follows: Sept. 5 (Light Infantry) at Oak Park HS, Sept. 12 (Novice) at Park Hill HS, Sept. 19 (Light Infantry) at Oak Park HS & Sept. 26 (Novice) at Park Hill HS and Oct. 3 (Light Infantry) at Oak Park HS and Oct. 10 (Novice) at Park Hill HS. All wrestlers who plan on participating in the B2M sessions should contact Coach Morales at airwarrior1225@gmail.com to be included on his email distribution list in case practice times, locations or dates change. If you have any questions or concerns please contact Coach Keck by email at jasonkeck@yahoo.com or at 816-863-7002. We will run two simultaneous groups – one concentrating on freestyle training for Fargo and one concentrating on folkstyle technique. The clinicians will be rotating between both groups. NOTE: There will be an early drop off (8-8:30am) and a late pick up for parents that have to work (5-5:30pm). Olympic and World Champion Vladimer Khinchesgashvili will be running a two session clinic at Park Hill HS from 10am-Noon and 12:30-2:30pm. Mark your calendars as this is one your athletes will not want to miss. This is one of those once in a lifetime opportunities. Cost of the camp for GHW current training semester members will be $50. Cost for GHW clubmembers not enrolled in the 2nd training semester will be $60. All others not affiliated with the club $75. No preregistration required. Sign up and pay on the date of the clinic. Elite JUDOKA Alisher Mantobetov will be running a NO GI clinic that will be at Oak Park High School. He will focus on Judo throws that can be used specifically in Freestyle and Greco. Ali is an elite JUDOKA and is a 5x National champ, 5th Place Moscow Grand Slam, 3rd Place Asian games. His introduction of Judo for Wrestling will only be $20.00 total ($10 per session). No Preregistration Required. Sign up and register on the date of the clinic from 9:30-10:00am. This Sunday we will run a State Champ Prep Workshop at Park Hill HS. The focus will be to get athletes ready to compete at the MO USA and KS USA State Tournaments coming up the first weekend of May. All ages welcome. No cost for current GHW 2nd semester club members. $20 for wrestlers affiliated with the club but not currently in the semester training session. $30 for all non club members. If a wrestler only attends one session the price is cut in half. No preregistration required. Sign up and pay on the date of the workshop. The Greater Heights High School Training Spring Semester will start on March 1st, 2018. Practices will be held on Tuesdays and Thursdays from 6-7:45pm at Oak Park High School and Sundays from 2-4pm at Park Hill High School. Check out the documents above for more information on costs, registration, etc. Stay tuned as updates will be posted. If you would like more information and to be added to our email distribution list please send an email to jasonkeck@yahoo.com. If your athlete is interested in wrestling this season with the Greater Heights program we highly suggest that your child attend one or both of the Preseason Clinics offered. The first one will be Nov. 5th at Park Hill High School from 1-2pm and the second one will be Nov. 12th at Oak Park High School from 2-3pm. Cost of each clinic is $10. We ask that participants bring t-shirts and shorts or sweatpants and a water bottle. Information on costs of the program,, practice times and how to register for the upcoming season will be provided at the clinics or you can also receive that information by emailing Coach Keck at jasonkeck@yahoo.com. Back to the Mat October 26th - Come Give the Program A Try! The final "Back to the Mat" Session will be held at Oak Park on October 26th. This gives beginners and newer wrestlers to the sport a chance to practice technique, have fun and learn a little bit more about the program and the upcoming season. Cost is $15 per participant and you will also complete a waiver and sign up form prior to the start of practice. No preregistration required. If you would like to receive the form in advance and want to be placed in our email distribution list then please message us with your email address or contact Coach Hiram Morales on Facebook or by email at airwarrior1225@gmail.com. Thanks to all those that joined in the free Summer Sundays the past 3 weeks! We hope you enjoyed the training and what the program has to offer. Participation was at an all-time high for August so that excites the staff as we build for the season. We will kick off the final GHW training semester on August 22nd. We will practice Tuesdays and Thursdays from 6-7:45pm at Park Hill High School and Sundays 3-4:45pm at Oak Park High School. All wrestlers are invited to participate in the semester training no matter what age, club affiliation or school your wrestler attends. 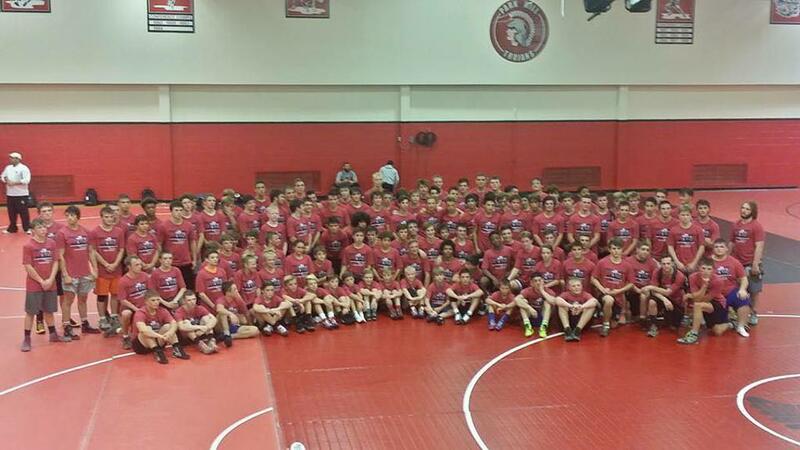 We hope to see some more of the Pee Wee and youth wrestlers jump into this semester to get a head start on the upcoming season - even if it is just one night a week. All those practice hours multiple and add up quickly. The final training semester will be for 10 weeks at the cost of $150 - both cash or check are accepted. Wrestlers attending one night per week (Sundays), the cost is $75 for the semester. All checks should be made out to Greater Heights Wrestling please. We keep a running tally to show who has paid and who has not. We will collect fees at the time your participates so please have your wrestler bring payment to the first session he/she attends. This semester all payment needs to occur at the start of the semester and this will be monitored closely so please just make sure that gets taken care of so we can concentrate on the wrestling and training. If you have not completed the registration paperwork then you can contact Coach Keck and have him email you it in advance or you can fill out the necessary documents on location at practice. Two dates to mark on your calendar are Sept. 23rd and 24th which will be the Dylan Palacio camp at Oak Park HS (Cost $50, all ages) and the MissouriWrestling.com / Greater Heights Wrestling Combine which will be held on October 7th and 8th (7th-12th grade) also at Oak Park. These are both don't miss opportunities. Lastly, please do not forget to check out our Facebook page and "Like" it as there is club related updates that occur weekly. A link to the Facebook page is located at the tab above. Thank you!If you have any questions please do not hesitate to contact Coach Keck by email at jasonkeck@yahoo.com or via phone or text at 816-863-7002. Again, we are really looking forward to a great semester! The Greater Heights wrestling program is a nationally respected and renowned wrestling club out of Kansas City, Missouri that has produced numerous youth and high school state champions, as well as national champions, placers and collegiate wrestlers. The youth program captured its 15th consecutive Missouri Youth State Team Title and just tied a state record the program set the previous year with thirty state medalists in a season. The Greater Heights wrestling program is successful because it doesn't just teach wrestling moves but rather how to wrestle in all positions. In addition, the program teaches athletes discipline, respect, and the importance of making good choices as a student-athlete every age level. We also teach the importance of creating a family bond with teammates and community members, how to be a leader on and off the mat, and most importantly, we teach athletes to love and appreciate hard work so that they can be successful in life after their wrestling careers have ended. If you are interested in your son or daughter reaching their full potential in wrestling, and in life, use the contact form below and make sure to read our News Section to keep updated on our development philosophies and team progress throughout the year. Greatness is earned. Not given. At Greater Heights we do our best to promote a team-oriented family atmosphere. From practices to tournaments to hang out nights, we truly believe in a family-centered philosophy. One of our coaches filmed a tournament day from start to finish to show the world what these young wrestlers go through beyond just the few minutes that they battle on the mat. It's not just about winning for us. It's about creating life-long friendships between the kids (and also the parents). We've achieved success only because our support system is so strong. Winning is a byproduct of tough practices, caring coaches, supportive parents, and a family atmosphere. Nothing great is ever accomplished alone.